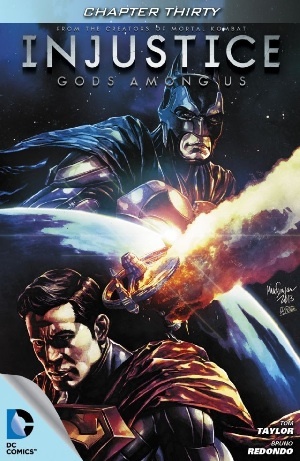 It's six years prior to the current events of Injustice: Gods Among Us, and a young man, James, details the event of his meeting Superman, which begins with him at 12 years of age, doing a daredevil run on his bicycle, down a steep hill. James crashes his bike, and looks up to see none other than Superman enquiring as to whether or not he's all right. James is dumbfounded, and Superman takes to repairing his bike, which doesn't come out right at all. He flies James home, and then leaves quickly to stop what would have been a robbery. After a brief meeting with Lois Lane, Superman then returns to the James' home, whose mother is equally at a loss for words when she sees him. He gives James a spare wheel and offers to help put it on with a wrench rather than super-strength. The story returns to the present time, where James laments the loss of Superman. James is now in Gotham City, attending Gotham University. He sees an image of Superman on television, which is angry and further laments his loss of the City of Tomorrow, Metropolis, and the Man of Yesterday. It gave me a lot to think about, and hopefully, other readers as well, after perusing this review. It goes without saying, though I'll say it anyway, that this is a parallel universe. However, we can no longer say that this is not our Superman. We now know that this Superman was the same inspirational figure, clothed in the same outfit no less. He could take the time to help James, stop a robbery by talking, and still make it to Lois and James again. He had time for the people he protected and saved, time which he no longer does. He can save the planet, but he is no longer the inspirational figure that James paid homage to by hanging his damaged wheel on the wall. That James now lives in Gotham City as opposed to Metropolis, due to its destruction, parallels Superman's descent as well, due to the destruction of his integrity and character. Taylor does a good job of illustrating the difference in Superman "done right", if you will, without having to show more of what he's doing wrong in this issue. While I initially didn't like the bike scene, it makes sense with less emotion and a little more thought. Superman has been shown to fix skyscrapers; surely he can repair a bike wheel. Yet, if he does, what does that do for James? If he stops him from falling, does James learn his lesson about taking such risks? If he repairs the wheel, James never gets the experience of flying with Superman, or learning that he can solve these types of problems without Superman's help. Does Superman put on an act for James' benefit? The reader will make that determination, but the lessons are gained nonetheless. The scene with the robbers is equally good, though it may not suit the champions of realism. Still, when the most powerful man on the planet gives you the opportunity to walk away, it's a pretty good option. In this issue Superman is finally a well-rounded character, and not because he's in the classic outfit or his actions are familiar, more so because his motivations are clear, rather than him be a one-dimensional figure, thrust into the same scenario with the same result repeatedly. He protects, but he doesn't control. He saves, but he doesn't supplant. He inspires because the man who should be above it all, isn't above what matters. When that core of his character is lost, we get Regime Superman, but is that not what "people supposedly" are driving for? The image on that poster is of our Superman, not another, and a six-year old can point out that it's a dead ringer for Regime Superman. It's hard and dark, the colors are deepened to enforce the effect, because dark and angry Superman is cooler, right? Art - 4: You have to applaud an artist who takes the time to ensure a family resemblance between mother and son... though at one point, Superman looks like he could be a member of the family. Cover Art - 4: Still hoping for the wreck.